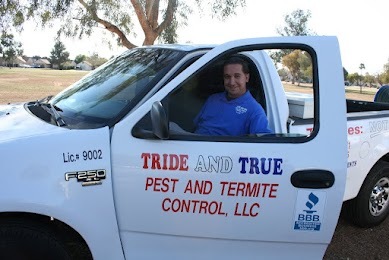 Here at Tride and True, we take pride in our efforts to provide our customers with a pest free environment. We provide a quality service to our customers through reliability, availability, knowledge, and communication. We provide solutions to people with pest problems under Tride and True Management standards. We believe a zero tolerance level can be maintained by using a calculated integrated pest management plan. We understand that sanitation, exclusion, and building maintenance, along with an arsenal of materials strategically placed can provide an ultimate defense to any invaders. Tride and True understands that being available when concerns arise is a vital part of service. That is why we understand that when extra service is needed, Tride and True guarantees that someone will be out within 24 hours of complaint to address these issues. Along with a quality service we make it an important role to communicate our plan to our customers. With communication, everyone involved knows the steps that are being taken in order to maintain a pest free environment. With communication we eliminate the “guessing game” that is often present in the service industry. So with written and verbal reports, as a team Tride and True and our customers understand exactly what is being done every time all the time!